Sometimes you go into a place which seems like nothing special, and yet they do one thing which lifts them above the pack. Maybe they do a couple of other things well, too— yet, frustratingly, they don’t quite do everything in a way that earns your admiration. At what point do you say, the heck with minor complaints, this is a place worth talking about? I spotted Rosticeria Los Fernandez on North Ave. in Elmhurst after shooting at Supreme Lobster for the next Sky Full of Bacon podcast. The wide range of things offered on the windows and signage was not necessarily a promising sign. It certainly didn’t look like authentic Mexican, and yet, something about it suggested to me that it had promise. Oh, right, I remember what it was: I smelled it driving by. Hickory smoke. The chicken was terrific— juicy and kissed with real smoke flavor. At this point, LTHForum rules would send me back into the kitchen to determine if it was a Southern Pride RCX-700 or an Avenue Metal custom aquarium smoker, but I didn’t do any of that and leave the question to future researchers. Instead I just contemplated what I found excellent about this meal— the chicken in both flavor and moistness, the steaming tortillas— and what I found rather ordinary, a list which would include the rice (a throwaway at the best of places, admittedly), the chewy (held too long after cooking, I suspect) cebollitas and, sad to say, both of the housemade salsas: a char-flecked red one and a lettuce-based green one, neither of which had much kick (refrigeration may not have helped them stand out, but it wasn’t the only reason). 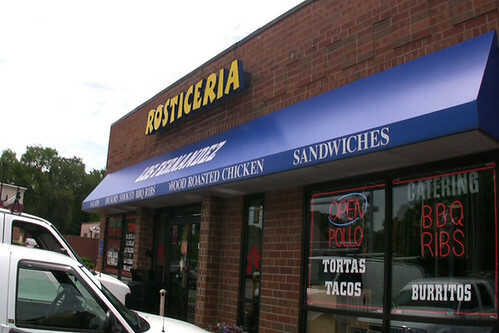 So I wish Rosticeria Los Fernandez was better all-around. Still, that chicken was about the best BBQ chicken I can remember having in a long time, anywhere of any nationality around town. Usual caveats about whether I hit a BBQ joint at the perfect moment apply, but if you have any reason to be out there, you should give them a try and help me decide if this is a real find… or a frustrating near-miss. My daughter played soccer around the corner from this place last fall, and we were just as tempted. Since then, I’ve been thinking how can I make the schlep out again before the next soccer season. I believe we also had some of the BBQ, which was not bad at all, not bad at all. 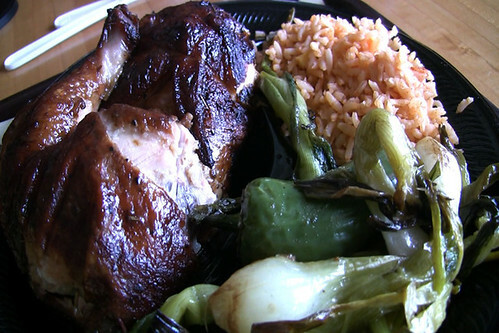 Who sez there’s no decent Mexican, roast chicken OR BBQ in Elmhurst?